Like many people, I have recently become fascinated the lives and loves of the ruling classes of the people of Westeros, where the occasionally charming inhabitants spend a lot of time bickering about who is in charge. Game of Thrones is very entertaining – but don’t get attached to any of the characters, as the lifespan in their world does seem quite variable. One of the many aspiring rulers – Daenerys Targaryen – spends a fair bit of her time around and occasionally riding dragons. My background as an aeronautical engineer got me thinking about the mythical creatures and it struck me that in order to fly, their world must work a bit differently compared to Earth. It’s possible to estimate the size of a dragon by comparison to Daenerys who looks to be about 1.6m (5ft 3in) tall with a mass of around 60kg (132lb). The dragon’s body seems to be about four times as long as her, around five times as deep, and about twice as wide, with a tail about the same length again and about as thick as her body. 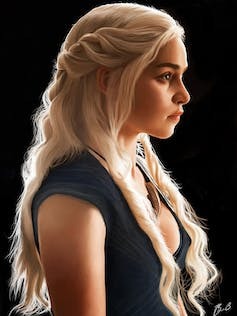 Assuming the density of dragon and woman are about the same then a fully grown dragon’s mass must be around 44 times that of Daenerys: around 2,600kg (5,700lb). Considering everyone in Westeros seems to move in a similar way to us on Earth, let’s assume the same gravitational pull, which puts the dragon’s weight at 26,000 Newtons (which we’ll call W) at a nominal acceleration due to gravity of ten metres per second per second (32 ft/s/s). Daenerys Targaryen, often seen on the back of a dragon. If we’re to understand the aerodynamics of flying dragons, we need two more bits of information. First, the wing area. Each wing seems to have a span roughly twice the dragon’s main body length, so let’s approximate the wings as two rectangles 4m by 8m (13 by 26ft), or 64m2 (340ft), which we’ll call S.
Second, the stalling speed, or slowest that the dragon can safely fly before it falls out of the sky. It would be reasonable to guess that dragons take off and land at roughly their stalling speed, just as aeroplanes and birds do. Judging by the programmes it seems that the dragon’s body-length of about 13m passes by in about three seconds, which puts the stalling speed at about 4.3 m/s or 14 ft/s. If we use the standard earth sea-level air density of ρ = 1.2kg/m3, this gives a lift coefficient of 36. Which is completely unrealistic. By comparison, a Rogallo winged microlight aeroplane – a tiny single or two-seater aeroplane comprising a light frame and a small engine suspended below a hang gliding-style textile wing – would have a lift coefficient of between 2.2 and 2.7. No doubt evolution has adapted the dragon’s wing to be highly efficient, but I had to make some assumptions here, so went for a maximum lift coefficient (or CL.max) of 3.5. 12 kg/m3, or about 10 timesthat Earth normal (we call that 10 bar) sounds unpleasantly high, but actually isn’t that bad. It’s about what a diver would experience at 100 metres depth – perfectly survivable. There’s empirical evidence that supports this. Watching a few episodes of Game of Thrones you’ll notice that pretty much anybody can pick up a spear or sword and throw it distances that an Olympic javelin thrower would be deeply envious of. Given that gravity seems to be roughly similar to ours, this suggests the thrown weapons are generating much more lift than on Earth – consistent with an atmosphere of higher density. What is the mix of gases in this atmosphere, I wondered? Earth’s atmosphere is 21% oxygen, 78% nitrogen, and 1% various other gases. We know that 21% oxygen is fine – you and I are breathing it at the moment – while 30% oxygen concentrations causes just about everything to become highly flammable (beyond that starts to verge on explosive). This seems quite likely on Westeros, as anybody going near the slightest puff of dragon breath seems to catch fire, while it’s noticeable that most of the locals are all paranoid about lighting fires anywhere except inside a stone castle. Westeros probably has a high-density air with around 30% oxygen, but no more. What of the rest? I’m going to hazard an educated guess here that it may not be nitrogen that we’re used to on Earth, but is instead argon – an inert gas which is the next most common gas on earth after nitrogen. Argon is 42% more dense than nitrogen and would allow a higher-density atmosphere at a pressure a bit lower than 10 bar. There are two laws relating to gases that can be used here to work out the behaviour of the air mix of argon and oxygen: Charles’ Law to add the components up, and Boyle’s Law to show what happens when the pressure increases. Applying these I can show that at about seven atmosphere’s pressure, a 70% argon, 30% oxygen atmosphere has our air density of 12kg/m3, and so dragons can fly. In simple terms – we can have a more dense atmosphere if the air is heavier – in this case by replacing the inert nitrogen we have on earth with the heavier (or more accurately, denser) argon. This argon-oxygen (or argox) mix will actually be moderately narcotic when breathed at high pressures. Perhaps this might in part explain the regularly irrational and downright aggressive behaviour seen among many citizens of Westeros. So a bit of basic physics, aerodynamics, and some working knowledge of human physiology can tell you a lot about Westeros – where dragons fly, fire is to be feared, and the people’s irrational behaviour is not necessarily down to what they’re drinking, but what they’re breathing. Fascinating article, thank you. However, would it not be more reasonable to assume that dragons have a density more closely related to birds (or bats) than humans? Since they are airbourne creatures, hollow bones and larger lungs would make sense. Larger lungs would also help with all that fire-breathing. This probably wouldn’t change your overall conclusions but might change the numbers. Well there is definitely logic there with the maths. But I am a firm believer that dragons can’t fly and that they don’t actually exist! They really aren’t airborne creatures at all! The premise is “Could” dragons fly, not “do” dragons fly. «Next Post Construction in the southeast: how can the region tackle its current skills shortage?